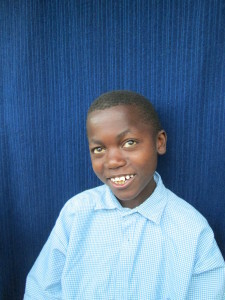 Bonny’s parents died of AIDS leaving behind five children orphaned. Luckily, Bonny is not HIV positive. Before his mother’s death in 2006, she entrusted the care of her three older children to HHFL and Bonny and his twin brother to St. Bernardo Orphanage. The Orphanage separated the twins and sent Bonny to a low class boarding school far away from Nairobi. After two years of absolute neglect at the school, HHFL decided to take over the custody of Bonny in January 2013. Bonny is an intelligent boy who lacked discipline and confidence when he first arrived at HHFL. Today, his demeanour has improved greatly and his rebelliousness has subsided. Being reunited with his three older siblings has been very beneficial. He is a very gregarious boy with a quick smile. He is very social and makes friends easily. He is a born leader, a quality which he displays daily in the play ground. He is a talented artist and a good athlete who loves soccer.